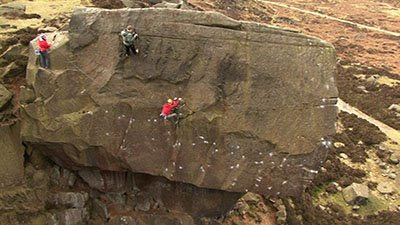 A team from Hot Aches were there to film ‘Grit Kid’ Pete Whittaker’s first ascent of ‘Silent Scream’ E7 6c. 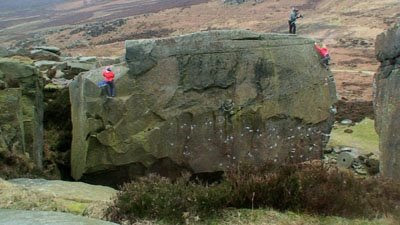 The route traverses the length of the Cioch Block in the Southern Quarry of Burbage South before finishing up the existing line ‘Masters of the Universe’ E7 6c. 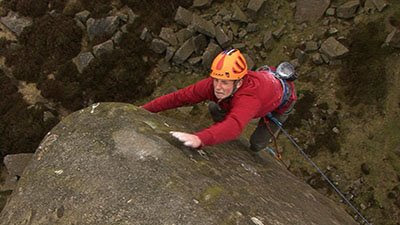 Andy Pollitt made the first ascent of ‘Masters…’ back in 1988. I remember it made the front cover of one of the mags, ‘High’, I think, maybe OTE. It’s an interesting route in that, like its neighbour ‘Offspring’ (as seen in ‘Stone Monkey’), both leader and second have to abseil to a starting belay on the corner of the block. 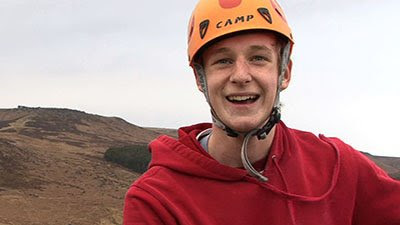 Pete had previously climbed ‘Masters..’ ground up… well, ground up apart from the abseil in! Maybe ‘Abseil Up’ is the correct style description. He then looked for a way to dispense with the ab rope. 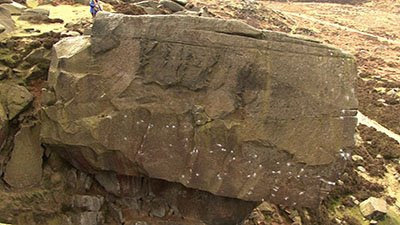 The new route starts on the left edge of the block and traverses a line lower than the existing girdle, ‘Silent Spring’ E4 5c. 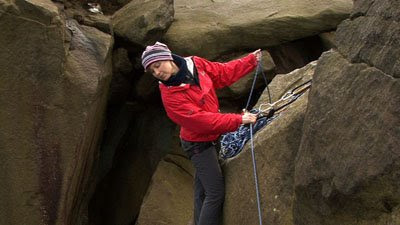 Pete’s mum, Jill, was belaying on the ledge. The route is protected by a few ancient rusty bolts, which date back to a time when aid climbing was practised on this crag (1960’s?). The route is also protected by a sling behind a ‘shipwreck’ of a block; I’m not sure what I’d trust more, the block or the rusty bolts. 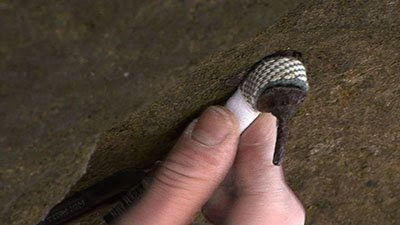 Once Pete reached the right side of the block he clipped a second rope into four more rusty bolts, belayed from the quarry floor by his dad, Paul. 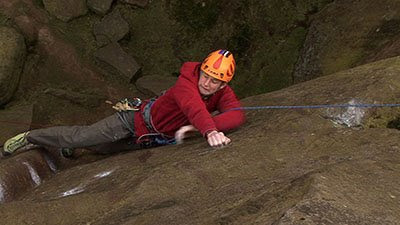 Then with a parent on each rope, Pete climbed the arete ‘Masters of the Universe’ to finish.